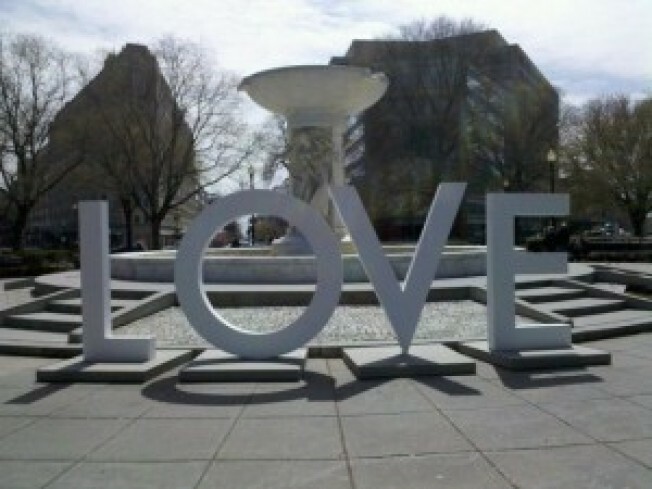 Those who take a professional interest in the rules surrounding National Park Service lands raised their eyebrows a bit when they saw that the giant "LOVE" sign, which showed up mysteriously in Dupont Circle last week, was actually an advertisement for the Virginia Department of Tourism. Silly Virginia, advertising isn't allowed in national parks! Perplexed, we inquired with spokeswoman Tamra Talmadge-Anderson, who said that there was no payment involved. "This is actually a public art installation which was permitted by the city," she responded. "It is a piece of sculpture for citizens and visitors to enjoy." Well, the relevant District agencies didn't know anything about it, and apparently, the Park Service disagreed: The "art" was taken down on Friday evening. And according to NPS spokesman Bill Line, it was all a big mix-up. "The organization that applied to the NPS for a permit misrepresented itself in the application process, informing the NPS staff the organization sought to engage in political free speech via the 'Love' sign that was erected in Dupont Circle," he writes. "However, upon further investigation, the NPS learned the organization was in fact working for the State of Virginia's Department of Tourism. When the NPS learned the real intent of the permitting process was abused, and that the 'Love' sign was in fact commercial advertising and not political free speech, the NPS instructed the organization to remove the sign immediately." Guess they'll have to stick to the Metro. Sorry Virginia, the Park Service Doesn’t Love You Back was originally published by Washington City Paper on April 4, 2011.